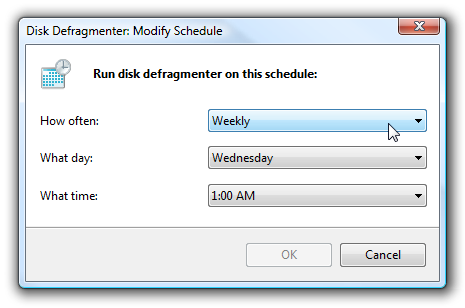 Windows 7 or Vista automatically configures Disk Defrag to schedule defragment to run once a week, usually at 1am on Wednesday. I don’t know about you, but I’m usually awake at 1am on wednesday, and I’d rather schedule it for a different time. Much better.. Not like I’m ever awake at 8am. 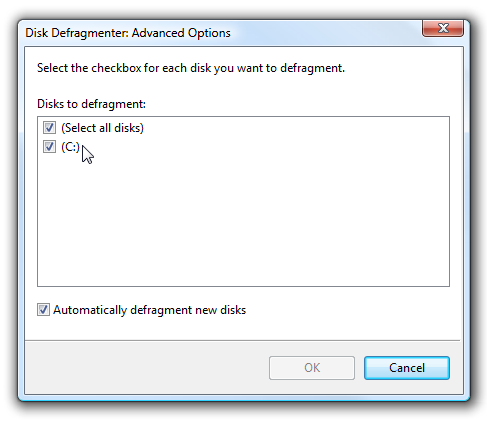 If you are on Vista and using at least Service Pack 1, you can also select which volumes will be automatically defragmented during this scheduled defrag. (Windows 7 users can select the volumes from the start screen). I only have one drive in this computer, but you would see the list of all the drives here.